I had meant to review this vodka as part of Martini Month, but ran out of time. So here we are, months later… and I’ve finally gotten around to it. Marketing gimmicks abound here. Cute little bottle with a bluish tint. Over-sized cork stopper. “Organic” on the label. “Gluten free” on the info card. All it’s missing are ironic geek glasses and a flannel shirt. Now, as I’ve stated repeatedly, I think vodkas really should come from Russia, Ukraine, or Poland. Jewel of Russia and Green Mark are my favorite vodkas of all time. (Why do I bother reviewing vodkas, anyway?) So a Hawaiian vodka? Distilled from organic sugar cane? On the island of Maui? 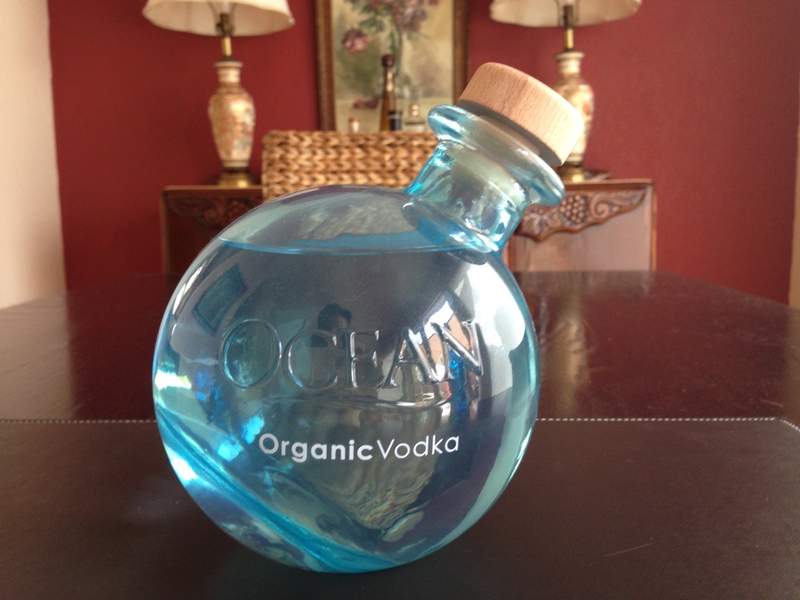 Gimmicky or not, Ocean Vodka is smooth, pure and delicious. I don’t often describe vodkas as “delicious” because they really shouldn’t taste like anything. However, as hokey as it sounds, there is a touch of the tropics in this little round bottle. Sugar cane or coconut, there’s a flavor in there that I can’t quite put my finger on… but it reminds me of home. That’s not to say that there’s a lot of flavor: there isn’t. This is a very neutral vodka. I’m guessing that I’m tasting residual flavors of organic sugar cane mixed with the high mineral content of the water used. Ocean makes an effort here to point out that all vodkas at 80 proof contain 60% water, and they’re right. It takes quite a bit of water to get vodka at a palatable alcohol level. Therefore, the water used is just as important as the distillate. Ocean makes some bold claims about their water, and I’ll let you go dig that information up for yourself. Suffice it say that I’ve had real Hawaiian spring water, and this vodka doesn’t taste like that. (And it shouldn’t.) But the mouth feel, the viscosity… is lovely. Anyway, very little flavor. The nose is also very neutral. But it’s there that I got a hit of the minerality present. If you drink Ocean Vodka over ice, you’ll be drunk before you know what happened. Ocean is NOT a polite drink. You’ll keep sipping away, blissfully unaware of how drunk you are. Then, you’ll try to get up from your favorite chair, and she’ll slap you to the ground! Think of it this way: The neutrality of vodka, the smoothness of rum, the clarity of mineral water, all rolled up into an 80 proof powerhouse. Gimmicks aside, this is a fine American vodka, and one I’ll happily keep around. I’ve been looking for a vodka that tastes like vacation. Thanks Eron!